there was never any chance for a loan agreement that would have wholly freed Greece’s hands. Loan agreements come with conditions. The only choices were an agreement with conditions, or no agreement and no conditions. The choice had to be made by February 28, beyond which date ECB support for the Greek banks would end. No agreement would have meant capital controls, or else bank failures, debt default, and early exit from the Euro. SYRIZA was not elected to take Greece out of Europe. Hence, in order to meet electoral commitments, the relationship between Athens and Europe had to be “extended” in some way acceptable to both. Greece won a battle – perhaps a skirmish – and the war continues. But the political sea-change that SYRIZA’s victory has sparked goes on. Michalis Nikiforos, Dimitri Papadimitriou, and Gennaro Zezza, who put together the Levy Institute’s stock-flow consistent macroeconomic model and simulations for Greece, have just released a new policy note, the upshot of which is that restructuring Greece’s unsustainable public debt is a necessary but not sufficient condition for a sustained economic recovery in that country. They also point to an interesting historical precedent that ought to inform the ongoing discussion of Greece’s debt and the conditions imposed by its official creditors. The troika’s official story—about how Greece’s debt-to-GDP ratio will be brought down from its current 175 percent to 120 percent by 2022—is, as the authors put it, “wildly implausible.” The official forecasts depend upon large primary surpluses (in excess of 4 percent of GDP beginning in 2016) being accompanied by robust economic growth rates (based on, according to the official story, expanding net export surpluses and dazzling growth in private investment)—which is, the authors point out, virtually unprecedented. around DM3 billion in annual income transfers to foreign countries was avoided. This is a very significant amount given that West German exports totaled no more than DM8 billion in 1950. For Germany to find DM3 billion without a contraction of its GDP and imports would have required a 40 percent increase in exports. We are often told how the trauma of Weimar hyperinflation shapes the German approach to policy to this very day (here’s a NYTimes headline from 2011: “Haunted by ’20s Hyperinflation, Germans Balk at Euro Aid”). In the context of the renegotiation of the terms of Greece’s bailout, Germany’s post-WW2 experience, in which it was the beneficiary of “the largest debt restructuring deal in history,” seems not to have left so indelible a mark on its national memory (at least as measured by the stance of current leadership toward the Greek plight). Selective amnesia aside, the key lesson to be drawn from the historical experience is that restructuring Greece’s public debt is only the very first step in what would be required to put the country back on its feet. The restructuring needs to be accompanied by a comprehensive policy program designed around fixing the eurozone’s structural defects and rebuilding a Greek economy that has suffered damage comparable to that inflicted by a protracted war. Levy Institute President Dimitri Papadimitriou discusses the four-month extension of Greece’s bailout agreement with its eurozone partners and the mood in Athens in this interview with Kathleen Hays and Vonnie Quinn. Update 2/28: more details here. Meanwhile, Lola Books is gearing up to release the Primer in Spanish next week. I’ll be in Madrid for the launch and for a series of meetings. I’ll give two presentations that are open to the public. Details are below. Hope to see our Spanish friends there! I’ll make a presentation at the Izquierda Unida economic program. 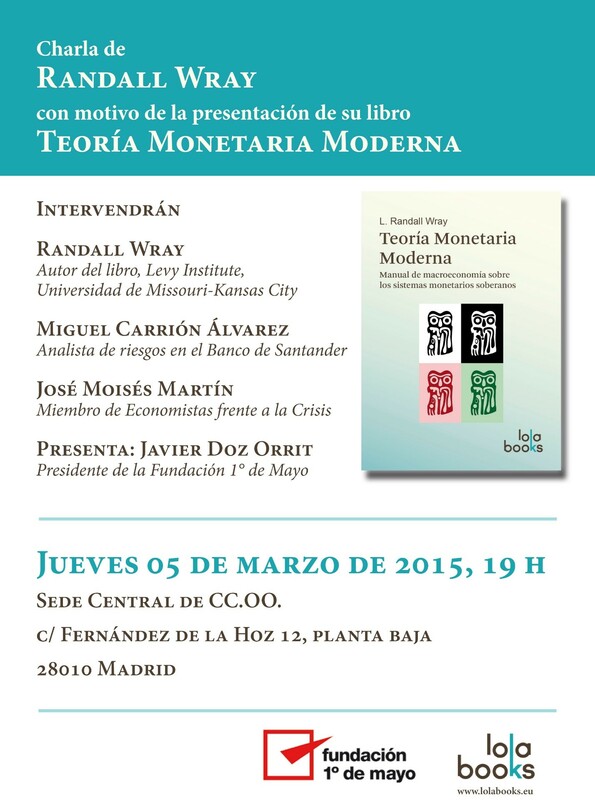 This event will officially introduce MMT into Spanish politics. Location: Sede Central de CC.OO. Time :19 h. See the event flyer below. 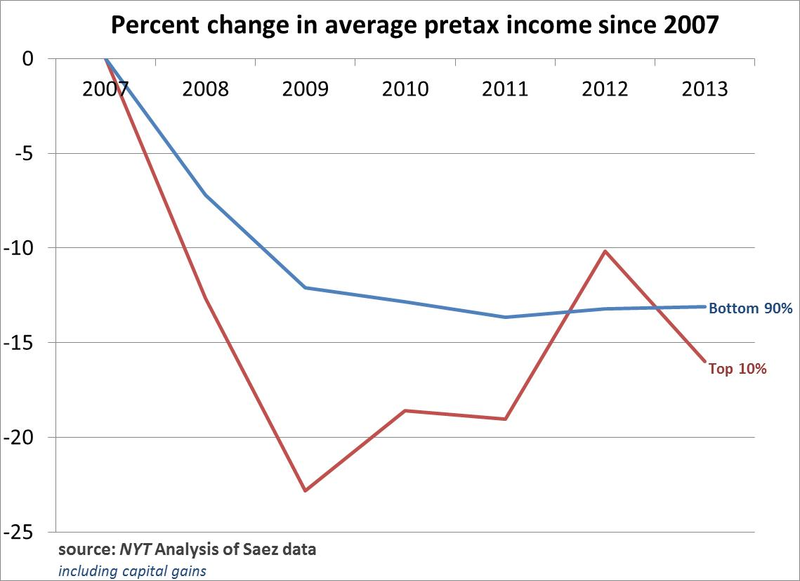 Here is the graph that appeared in the NYT (I’ve reproduced it below showing only the bottom 90% and top 10% of families using the same Saez data). 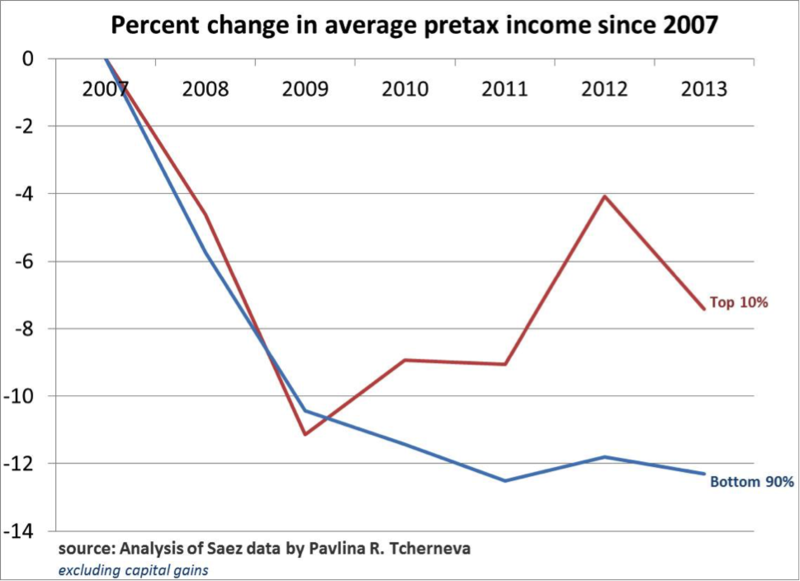 Now let’s reproduce the exact same graph, using the same data but excluding capital gains. The trends reverse. The bottom 90% of families have lost proportionately more than the top 10% since 2007. Now, I am not fond of excluding capital gains (I am in favor of annuitizing them), because they are very important to income dynamics, but still, without capital gains, the bottom 90% lose proportionately more (relative to the top 10%) than with them. In any case, if we include the top 1% and the 0.01% in the above two charts, one would find that they do lose proportionately more including or excluding capital gains. So let’s look at complete business cycle data. 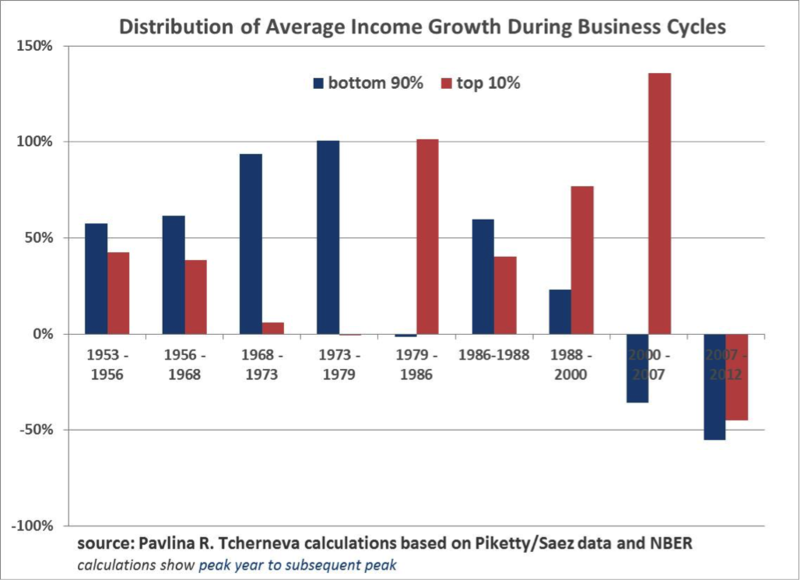 The following chart shows how the distribution of income growth has evolved from one peak to another. We live in a casino economy driven by serial asset bubbles, where the incomes of the wealthy (and not just their capital gains) are increasingly tied to stock market performance. So when the biggest bubble in human history popped, the wealthy families lost a ton of income. At the same time middle class households fell into poverty, lost their decent jobs and pay, and got unemployment insurance or food stamps from the government. Can one really conclude from this that inequality is not “that bad”? As an example, inequality will not be “that bad” if one person in the US earned 100% of all the national income, and then the ‘evil government’ (or ‘benevolent dictator’; take your pick) decided to tax most it and then gave transfers to the rest. But is this the kind of ‘better’ income distribution that we are aiming for? Aren’t we all talking about an economy where most people have decent jobs, decent wages, decent salary growth prospects, and a decent chance to participate and share in that growth? There are many ways to slice and dice this data. I have looked at expansions because they answer a very specific question: Once the economy returns to some normalcy and promises to deliver prosperity, to whom does it keep its promise? And the answer is, increasingly to the top 10%. The problem with the NYT article is not the inequality chart, even though it shows an incomplete and thus misleading business cycle picture. The problem is the conclusion: that ‘taxes’ and ‘transfers’ are the solution to the deep structural economic problems that are causing the generation and distribution of incomes to be so inequitable from the very outset. As an analogy, consider a United States with a common currency but no Treasury to conduct macroeconomic policy, stabilization or stimulus spending. Imagine also that the Federal Reserve was banned by law from guaranteeing U.S. government debt. And imagine that one state, say, Illinois (think Germany) was the major net exporter, accumulating dollars (euros) while most other states (as is the case in the eurozone) were net importers, thereby bleeding dollars (or euros). Finally, imagine Illinois providing a loan to cash-strapped Georgia (think Greece), dictating that it implement slash-and-burn privatization of public assets and drastic cuts to state payrolls, pensions and other essential programs. This, in essence, is the situation in the eurozone today. But Greek voters last month rejected continuation of an austerity program that has plunged their economy into depression, voting in a government determined to break out of the current terms on which Greece gets help from the Troika. The more recently released annual growth rate of 2.4 percent for 2014, as well as the 2.2 percent final figure for the year before, indicate that he is right when he argues against the political “consensus” that “borrowing money is the last thing the government should do.” In fact, fiscal policy still needs to be made more stimulative, perhaps through increased infrastructure spending. Kuttner decries a situation in which an “austerity lobby” is set to bat down such efforts in Washington. 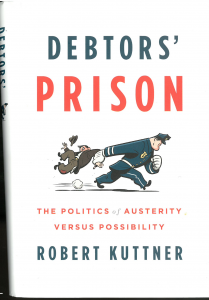 Also notably, Kuttner uses a detailed historical argument to challenge the notion that fiscal austerity is the answer to foreign debt problems in highly indebted economies such as Greece. In essence, keeping economies in a debtor’s prison is not in anyone’s interest. El esfuerzo intelectual que se realizó en el campo de la física tras la aparición de la teoría de la relatividad o del modelo copernicano, no se llevó a cabo en la economía tras la aparición del dinero fíat. Teoría Monetaria Moderna es la plasmación de dicho esfuerzo intelectual. 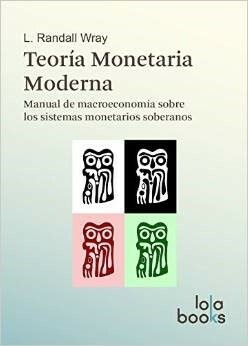 En este libro se expone claramente qué es el dinero en realidad y lo que es más importante se exponen las políticas económicas que deberían llevarse a cabo para llevar a la práctica un programa político coherente con dicha realidad. L. Randall Wray es doctor en economía y profesor en la Universidad de Missouri-Kansas City, así como director de investigaciones del Center for Full Employment and Price Stability. Además, pertenece al Levy Economics Institute of Bard College de Nueva York. I’ll be in Madrid for the book launch. See you there. More details to follow. 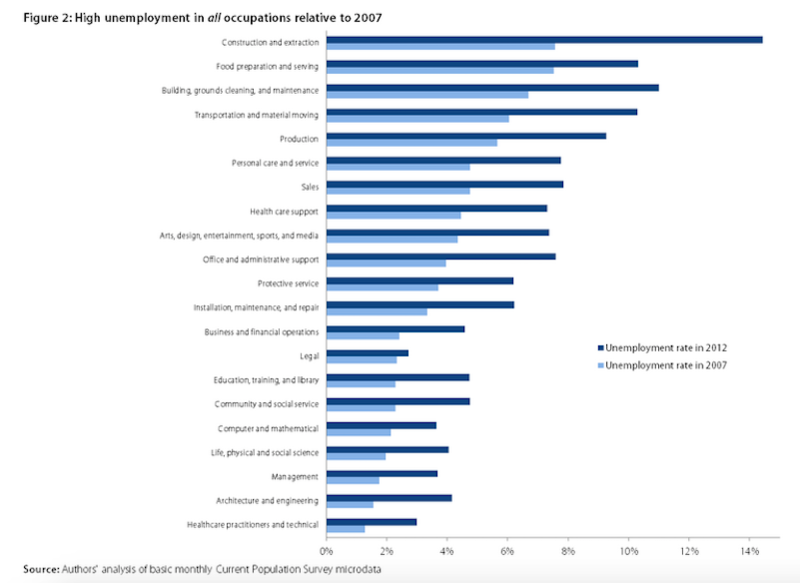 The Workers’ Think Tank: With an eye on the United States and Greece, scholars at the Levy Economics Institute are developing plans to ensure full employment, by Sasha Abramsky, The Nation. As Sasha notes, the Levy Institute has a novel approach to fighting unemployment: JOBS! Hardly anyone ever thinks about that—that the cause of unemployment is lack of jobs. For some reason, virtually all policymakers and economists (including progressives) think that jobs will magically appear. True, some suggest that US unemployment is created because China (et al.) “steals” jobs that are rightfully due to America. Hence, the solution is to steal them back. But why not just create more? Is it really that hard to come up with a list of things that people could usefully do, right here in America? “Yet scratch below the surface and you’ll see that the United States still has a considerable economic problem. While the official unemployment rate has fallen to 5.6 percent, the lowest since 2008, the percentage of the adult population participating in the labor market remains far lower than it was at the start of the recession. At least in part, headline unemployment numbers look respectable because millions of Americans have grown so discouraged about their prospects of finding work that they no longer try, and thus are no longer counted among the unemployed. Depending on the measures, only 59 to 63 percent of the working-age population is employed, far below recent historical norms. No matter where you look, there are plenty of job-seekers. And these data do not include those who’ve given up hope: official unemployment rates only include those actively seeking work. If you only hide 5 bones and send out 10 dogs to find them, you can be sure at least 5 dogs come back boneless. That’s what it still looks like across all sectors of our economy—far too few jobs out there. Five years into “recovery.” And with what looks like a possible slowdown coming.